West elevation - "The Revolution Begins Now"
South elevation - "It's About Time"
East elevation - "Tribute to Tony Goldman"
North elevation - "Iron Fireman"
"The Revolution Begins Now" is a quote from Mark Goldman that refers to the mural project explained above. Each of the three hands holds a different type of painting tools. Note "Videos de Mexico, indicating that the photos are video covers. 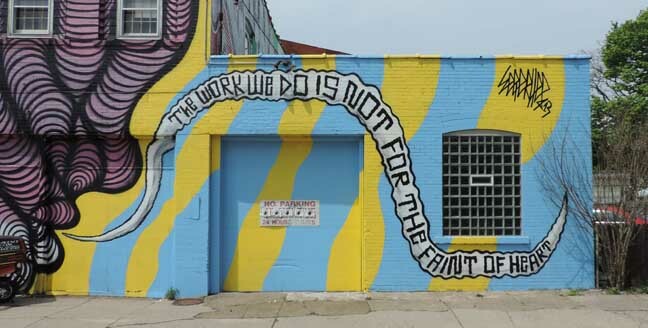 The quote is from Tony Goldman: "The work we do is not for the faint of heart"
Allen Street Street Artists Collective‬: David Chino, from New York (trained at UB); Septerhed, a leading street artist from Los Angeles; Patrick Gallo, Brooklyn-based, Buffalo-bred; Johnny Chow; Max Collins and Meg Corcoran. In addition, as a special tribute to the late, great Buffalo-born street artist Spain Rodriguez, Ian De Beer has been commissioned to paint a 2000+sq ft mural in honor of our home-grown street art pioneer. 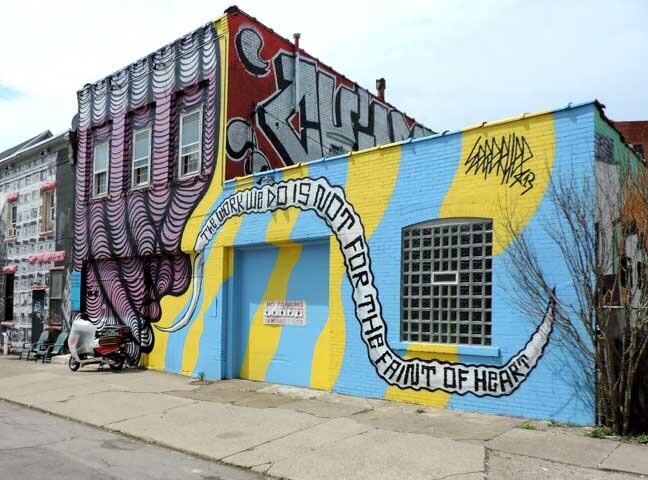 Dedicated to the work of Spain Rodriguez & Tony Goldman, The Allen St. Street Art Collective is an exposition of street artists from LA, NYC and Buffalo. 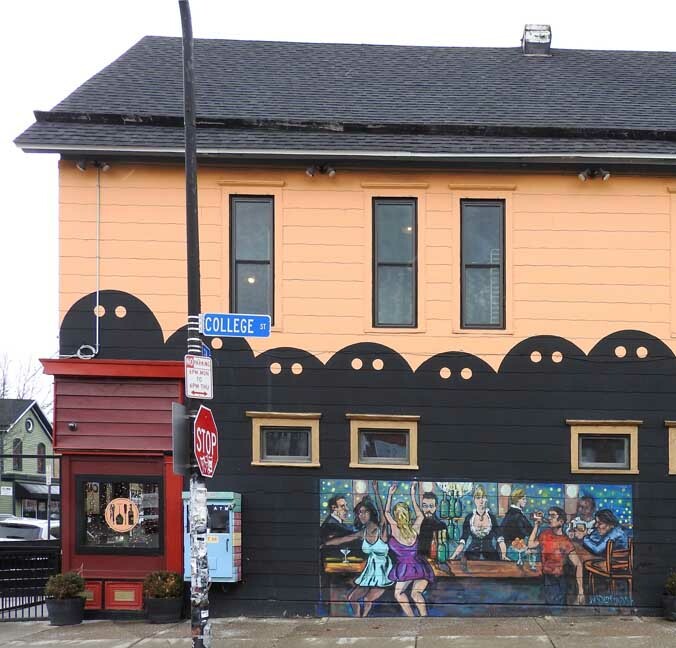 The newly formed Allen St. Street Artists Collective is a project organized by Buffalo arts supporter, author and developer Mark Goldman to help transform the neighborhood and provide more opportunities for street artists to work legally. 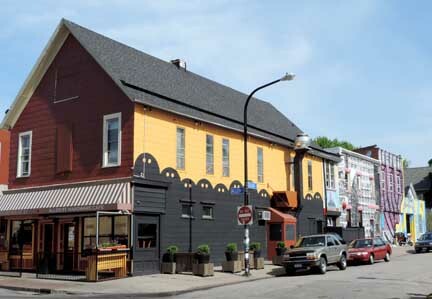 Allen Street, the heart of Allentown, Buffalo, NY, is conceivably the art and music capital of Buffalo. 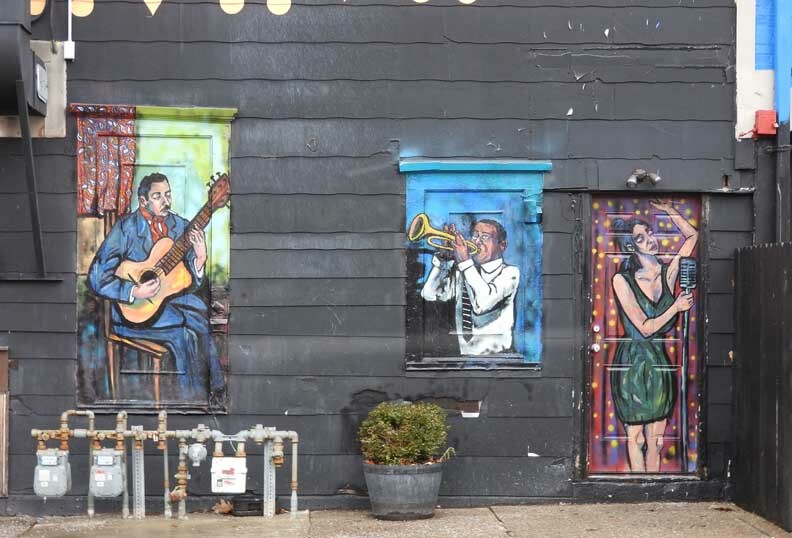 A vibrant and diverse community, it is home to many small art galleries, niche restaurants, live music, its own art festival, and even its own street art collective. 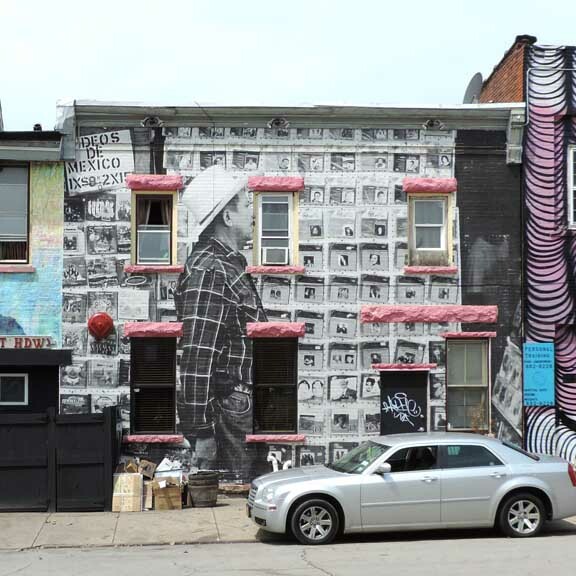 This perfect cocoon of arts and culture grew colorful wings in the form of the Allentown murals. Many internationally well-known musicians can trace their success to playing at Allentown venues like Nietzsche’s, which also boasts hosting Buffalo’s longest running open mic night. 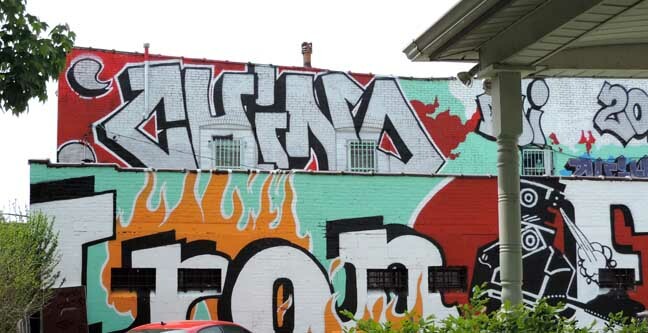 It is only fitting that many nationally well-known street artists (including many talented local ones) painted the expressions of this microcosm of Buffalo culture. 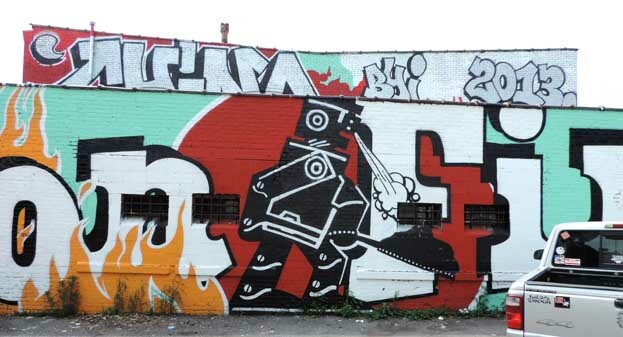 No blog about the Allen Street murals would be accurate without a mention of the Allen St. Street Art Collective (#ASSACollective), a group of street artists brought together by arts supporter, developer and curator Mark Goldman in 2013. 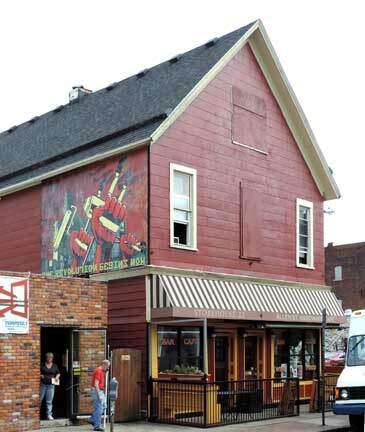 Goldman wanted to “save” Allentown in a period just before the Buffalo Renaissance, where many empty storefronts reflected the economy and the exodus of young residents from Buffalo. 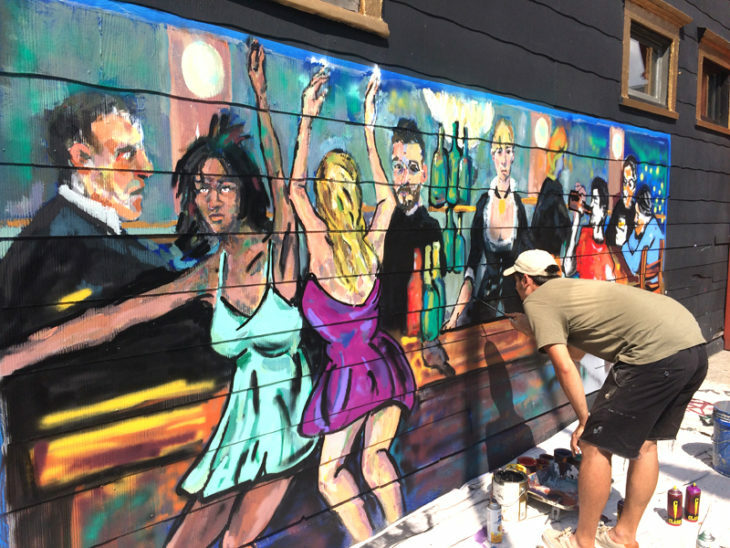 Their handiwork can be found all over Allen St. Hardware Café, stretching well into College St., as well as the recognizable comic mural “Tribute to Spain Rodriguez” on the side of Holley Farm Market. 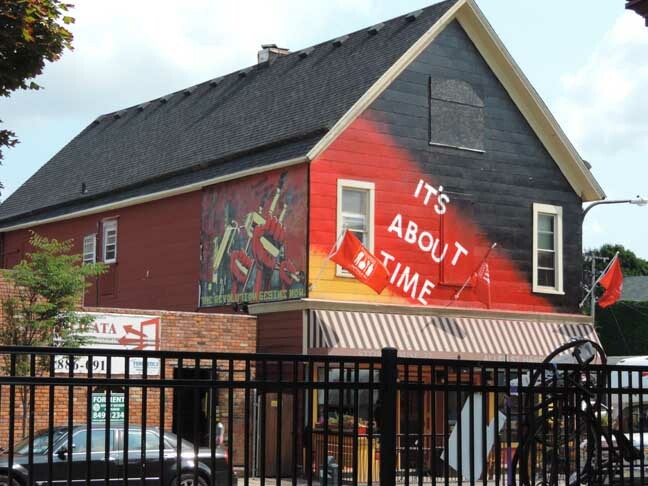 While they weren’t the first or only street artists to paint murals in Allentown, they painted a good portion of them, and put a spotlight on Allen Street once again, a result of and adding to the Buffalo Renaissance, and inspiring more art and murals to come. 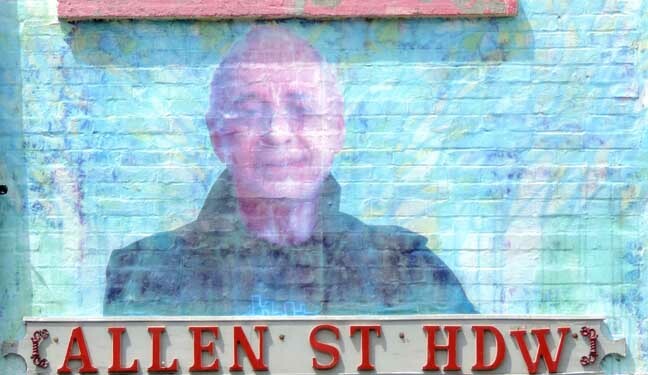 Buffalo historian, social advocate and businessman Mark Goldmana is planning to create a series of murals in Allentown, while dedicating the effort to his late brother and public art visionary Tony Goldman. In an email sent out to local press, Mark made clear that the initiative would be guided by a professional acumen that would greatly enhance the spectrum of art in the city. "What my brother Tony demonstrated by his visionary curatorial skills is that street art, done at its best and most sophisticated level, has the power to transform and empower communities. At his internationally known wall at Houston and Bowery (photos, online June 2014) and on his fantastic, dream-like productions at the walls of Wynwood in Miami (photos, online June 2014), Tony, by sponsoring and supporting the world’s leading street artists, gave voice to a new generation of artists while at the same time bringing unbelievable energy and art to the streets of long-forsaken parts of two major American cities. His work, though cut-short by his untimely death on September 11th, 2012, will live on, however, not only in Soho and in Miami but on the streets of Buffalo New York where I, by creating the Allen Street Street Artists Collective, will attempt to do for the streets of Allentown what Tony’s work did for New York and Miami. It is as a tribute to him and to the people of Buffalo that I have undertaken this most challenging and important project. As Tony himself said: “The work that we do us not for the faint of heart." What is the difference between street art and graffiti? 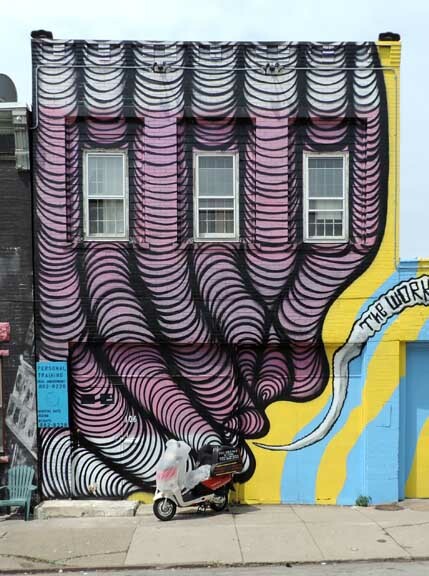 That decades-old debate is already tired to the point of irrelevance in progressive communities across North America, from the colorful warehouse walls of the Wynwood Art District in Miami to the Bushwick section of Brooklyn, now an international destination for street artists from around the world. 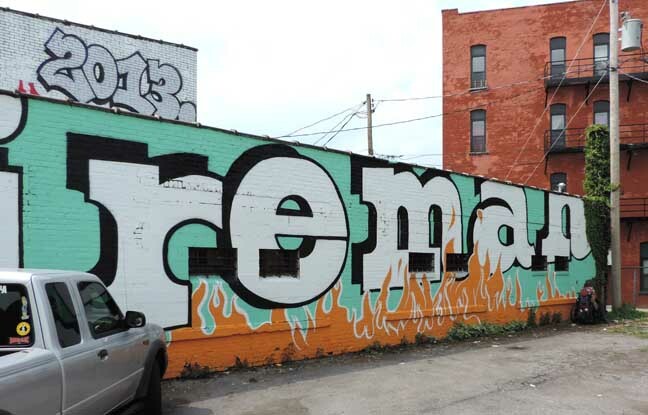 But it is just beginning to play out in Buffalo on the walls of several buildings owned by developer Mark Goldman near the intersection of Allen and College streets. And it’s about time. 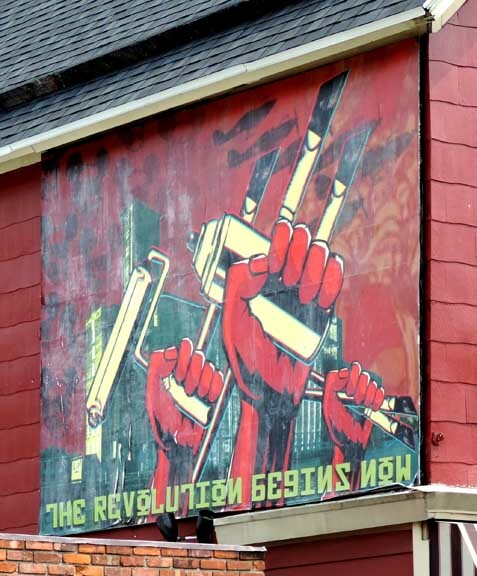 By the time Allentown’s monthly gallery walk gets going Friday afternoon, those walls will be covered with a riotous collection of new murals and wheatpasted photographs, courtesy of the newly established Allen Street Artists Collective. They range from Ian DeBeer’s wonderful and eye-popping tribute to the late comics artist Spain Rodriguez on the side of the Holly Farms convenience store to a striking image of a hulking gorilla by local artist Max Collins, directly across College Street. 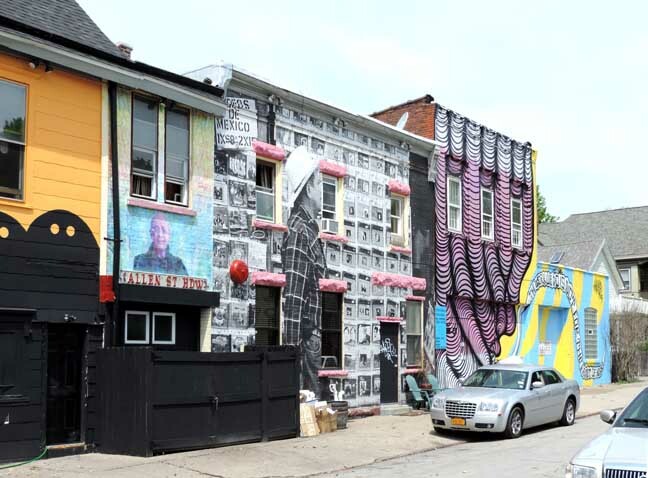 The legal project, quickly organized by Goldman as a tribute to his late brother Tony, who died nearly a year ago, has changed the visual landscape of the neighborhood in an extraordinarily short time. 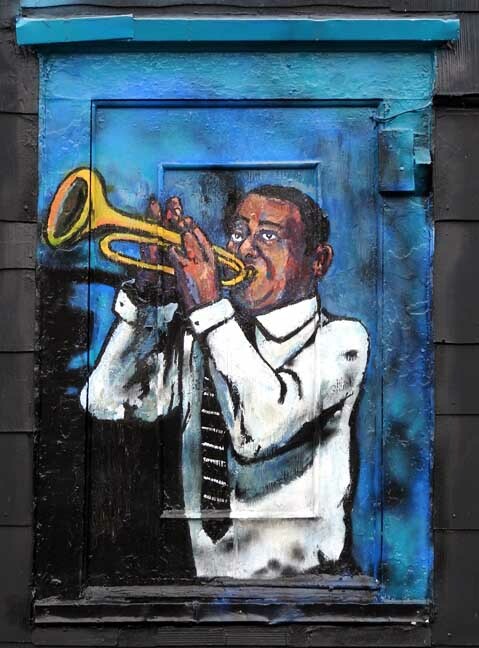 You might think that a project as inspired and quickly executed as this would draw immediate praise from across the community, as similar projects have done in so many places where street artists have paved the way for neighborhood revivals. 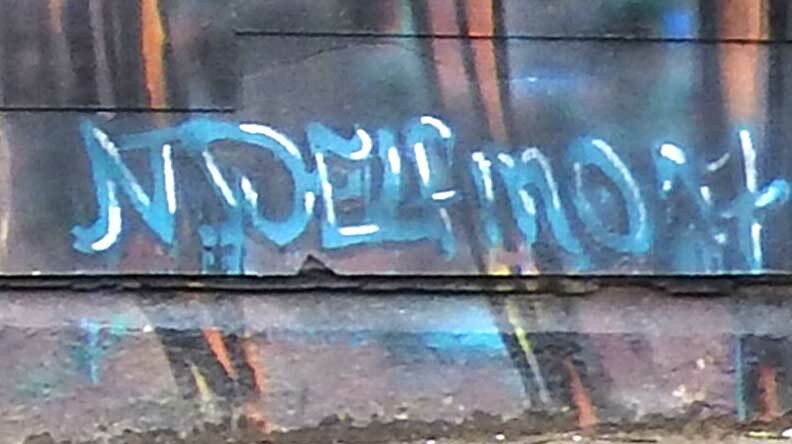 Judging by the initial comments on my story about the project, you could easily come away with the impression that urban art terrorists had descended on Allentown armed with spray-paint cans and Marxist attitudes in an attempt to destroy the neighborhood and offend as many people as possible in the process. 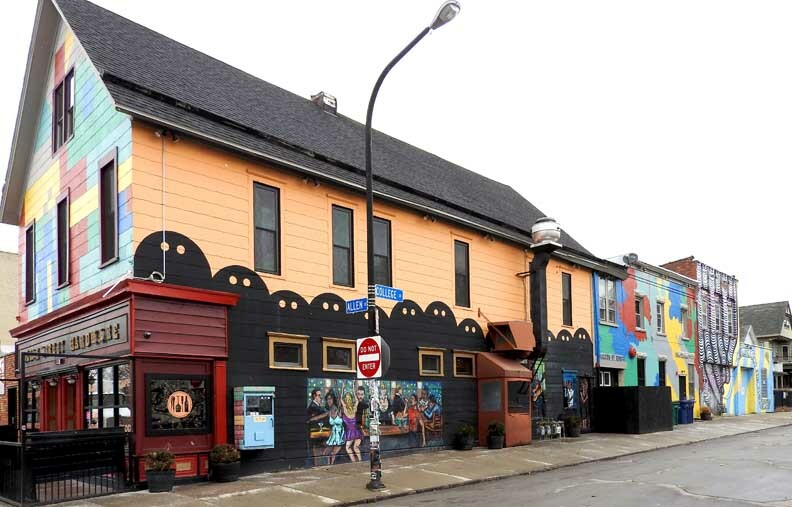 Buffalo, so artistically and culturally progressive in other ways, has been far behind the ball on this. But thanks to Goldman and his new crew of gifted street artists, it may finally be starting to catch up. Moments ago I stopped over to Allen Street Hardware, to check out the latest Allentown mural underway. 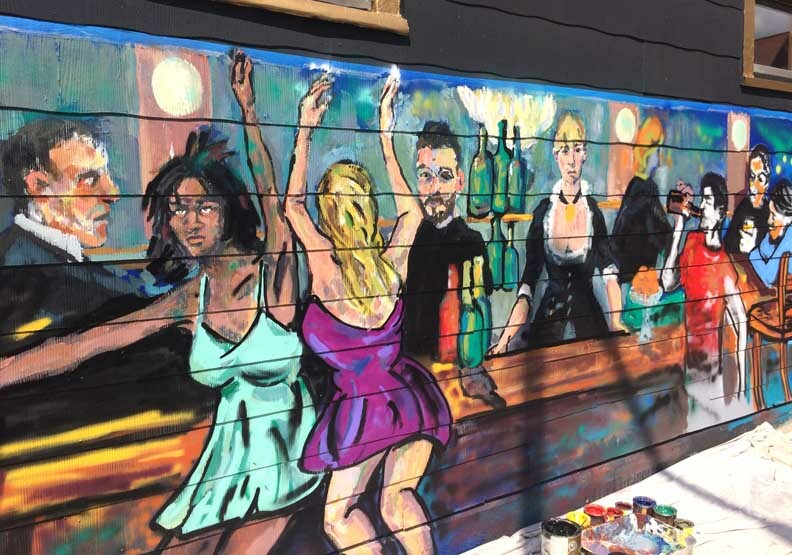 Artist Nicholas Delfino was busy trying his hand on the wall of the building, patio side. Upon arrival, I stood there for a short while, watching him work on his piece. Eventually, I spoke up, saying that I was there to update BRO readers on his progress. It turns out that we had met some time ago, which is a scenario that any Buffalonian can appreciate – the city is like a giant couch, right? 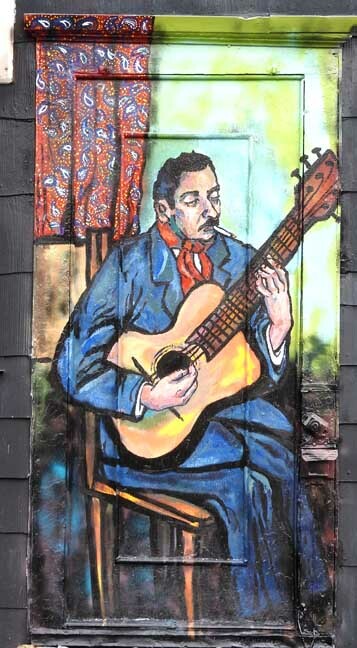 I asked Nicholas about the work, and he told me that it was in dedication to Hardware’s live music scene, with inspiration from some of the art greats such as Édouard Manet and Henri de Toulouse-Lautrec. The influences were readily apparent, and so was the artistic expertise that Nicholas was infusing into his work. This mural might not be the largest in town, but it packs a colorful punch that hangs with the best of them.